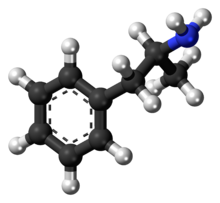 Amphetamine (pronunciation: i/æmˈfɛtəmiːn/; contractit frae alpha‑methylphenethylamine) is a potent central nervous seestem (CNS) stimulant o the phenethylamine class that is uised in the treatment o attention deficit hyperactivity disorder (ADHD) an narcolepsy. ↑ "Pharmacology". Dextroamphetamine. DrugBank. University of Alberta. 8 February 2013. Retrieved 5 November 2013. ↑ "Pharmacology". Amphetamine. DrugBank. University of Alberta. 8 February 2013. Retrieved 5 November 2013. ↑ 3.0 3.1 3.2 3.3 "Adderall XR Prescribing Information" (PDF). United States Food and Drug Administration. Shire US Inc. December 2013. pp. 12–13. Retrieved 30 December 2013. ↑ Taylor KB (January 1974). "Dopamine-beta-hydroxylase. Stereochemical course of the reaction" (PDF). J. Biol. Chem. 249 (2): 454–458. PMID 4809526. Retrieved 6 November 2014. Dopamine-β-hydroxylase catalyzed the removal of the pro-R hydrogen atom and the production of 1-norephedrine, (2S,1R)-2-amino-1-hydroxyl-1-phenylpropane, from d-amphetamine. ↑ "Substrate/Product". butyrate-CoA ligase. BRENDA. Technische Universität Braunschweig. Retrieved 7 May 2014. ↑ "Substrate/Product". glycine N-acyltransferase. BRENDA. Technische Universität Braunschweig. Retrieved 7 May 2014. ↑ 11.0 11.1 "Adderall IR Prescribing Information" (PDF). United States Food and Drug Administration. Barr Laboratories, Inc. March 2007. pp. 4–5. Retrieved 2 November 2013. ↑ "Properties: Predicted – EP|Suite". Amphetamine. Chemspider. Retrieved 6 November 2013. ↑ "Chemical and Physical Properties". Amphetamine. PubChem Compound. National Center for Biotechnology Information. Retrieved 13 October 2013. This page wis last eeditit on 6 Apryle 2015, at 13:31.